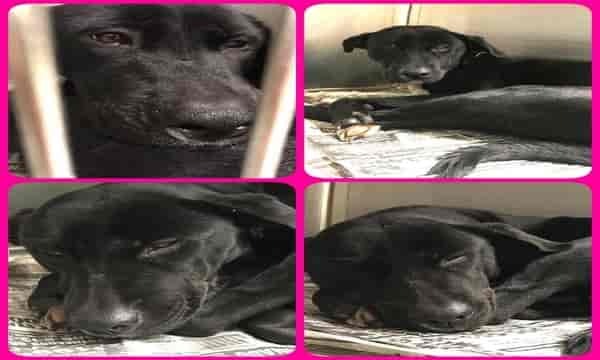 This beautiful jet black girl listed as a 3 yo lab mix is Sue #A1909988. Her best chance at exposure is here with the little dogs in pod B though she is 41 lb. Sadly curled up, she looks forlornly at me, clearly not feeling well. You can see the runny nose in the first pic. This signals an upper respiratory infection which when identified by kennel workers will promptly result in her being placed in isolation, no longer to be seen by the public. 2 Responses to "Sadly curled up clearly not feeling well, but nobody seem to care with black dog"
Don't know what hapopened to her ... page unavailable. But then ..no DATE or ID# ! !